That third panel came out really good. That’s my favorite shot of Ence ever. Locke looks good too I guess. This new site actually required a great deal of coding on my part. Unlike the forum, where I found a nice style to apply to it (with a bit of tweaking of course). In addition to my vast knowledge of HTML (which isn’t all that vast) I had to teach myself CSS. Not all that much fun, but I think I figured it out. Speaking of the forum, I think it’s just starting to come alive. If some more people join up, it should become a nice place for everyone to hang out. 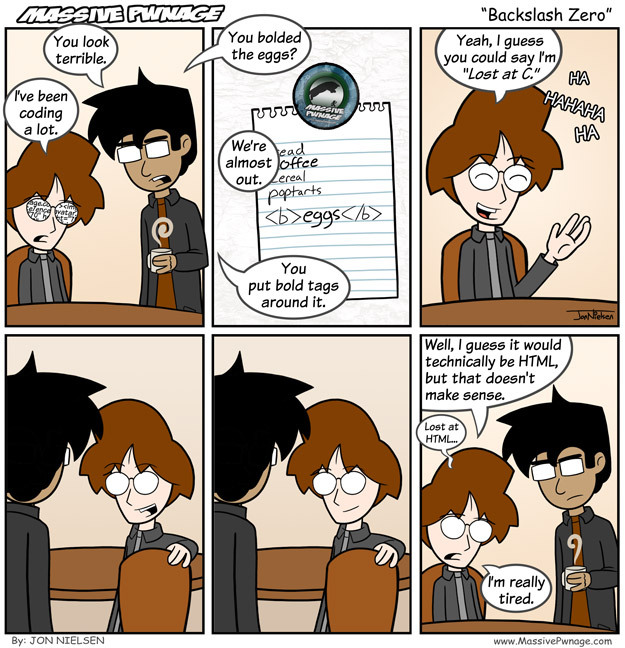 This entry was posted on Friday, October 31st, 2008 at 12:00 am and is filed under Comics. You can follow any responses to this entry through the RSS 2.0 feed. Both comments and pings are currently closed. Hahahaha. I know that feeling. I think I have actually done something like that in a school paper. Oooooohmigawd…. That’s so punny, I could die…. I love it!! Also, I approve of that grocery list. Good list.